Locks, leaf-soup, and little room for manoeuvre #narrowboat #England – The Diesel-Electric Elephant Company. After leaving the bright lights of moorings in Market Drayton the Cardinal and I mooched through a somewhat narrow cutting and up through five more locks in a row. The start of the day was very quiet indeed, with no people, no dog-emptiers, no other boats moving. However, by the time I’d worked up to the top lock I had two other boats nibbling at my heels a couple of locks back and in the combined lock landing and winding hole and service area of Tyrley we were suddenly one of six narrowboats, all doing different things and wanting to move in different directions. Twas fun! The short stretch of uber-narrow canal (not sufficient room for two boats to pass, should they meet…) was a mere taster of what is yet to come. There’s about a mile or more of narrower and more weird up just around the bend from where we’re moored. Egads O’Reilly, and J.F.D.I., Hutson. This first stretch runs through sandstone that reminds me of (yet) a(nother) place that was home once, The Wirral. I have memories of that all being this red sandstone and gorse bushes stuff. Overhung by trees, it was akin to cruising through a tunnel, albeit a light and airy one compared to the real tunnels. The locks here all carry official warnings about underwater obstructions preventing use of the lock landings (and indeed one lock has none such, not even a vestige of a bollard), and about strong by-washes sending unwary narrowboats out to sea and so forth. The warnings are all true and, if anything, they understate the loveliness of the engineering details. I suppose that the Victorians were understandably too tired after blasting a cutting through the rocks to be bothered with the usual niceties. What doesn’t already sport the infamous Shropshire Shelf sports instead peninsula of similar size to The Wirral. I swear that on two or three of these locks there are small, native fishing communities living on some of the rocky outcrops, serving the needs of small, native fish-eating communities living quiet but fecund lives in the soggy and overgrown, receding towpath edges. The edges shown below on the first lock are neat, but I found the one and only non-shelf gap that would let me get in close to the side. The Cardinal waiting for me to prepare the first lock for him (Tyrley). The official instructions – and the canal word of mouth – say to prepare and open the lock ahead, and to move the boat straight from one lock to the other. So, that’s what I did. It does involve rather a lot of walking back and forth between locks though. With me it also involved extra time, since I won’t leave my boat untended in a filling or emptying lock, for obvious reasons, and especially not to just go back and close the gate behind. Here’s the Cardinal at the first lock, waiting patiently for me to open the second gate, walk back to fetch him, move us in, close the gates and begin filling. The Cardinal did quite a lot of waiting around for me to fetch him, yesterday. Up and down, back and forth, open those gates, tote that bale, move that …narrowboat. You may have noticed the autumnal covering of slightly unwell, dying and already dead leaves. Very pretty. One slight disadvantage is that the leaves also fall into the water, as do twigs and small branches at this time of year, so the water is more like woody vegetable soup than anything else. Half a dozen times I had to clear the propeller of leaves. They collect like a ball and the first indication is usual engine revs but boat going nowhere fast. With luck, clearing a leaf-ball just involves a quick blast of reverse, then letting the boat drift on in neutral for a yard or two, then back into full-steam ahead and don’t spare the stokers, Mr Christian. This soup of branches, twigs and leaves was waiting for me to push it into the lock as we entered. This soup was waiting for me to let it down into the lock as I filled it. Stout canal chaps with rakes come along and clear out the by-wash sluices, but they can’t do much about the main canal itself, it would be a never-ending job. I discovered one thing on the Tyrley flight – I like gate paddles. If you look at the photograph above there are cranks to wind up and lower three paddles, one each side which allows water under the stonework and around the lock gate, and one on the lock gate itself, which lets water through directly. These too all carry dire warnings about flow and turbulence and killing dolphins and saving the whales, but I found that if opened slowly they bounced the Cardinal around not a jot. The noisy, gushing, foaming white flow that they produce looks intimidating, but it seems to channel itself nicely and neatly, not banging the boat to either side, not dragging him – if opened gently – back and forth, as the side-paddles do. Doubtless these locks are unique and the next time I use gate paddles I’ll have whole new and different lessons to be leaned. For the moment though, I likes ’em. That said, the water does gush out from half-way up the lock gate, so you do have to make sure that the water isn’t just gushing onto the well-deck and into the boat! As we rose up through the locks and out of the (first) cutting we got back to the more familiar open, green scenery (and cows). It’s a bit of a walk up to prepare the next lock, go back for the Cardinal, leave him tucked up behind closed gates ready to be worked through, then back again to close the gates of the lower lock, and then back up to etc etc – doubtless yesterday, once totalled, it added up to my walking a step or two as well as working the locks… goodly exercise. 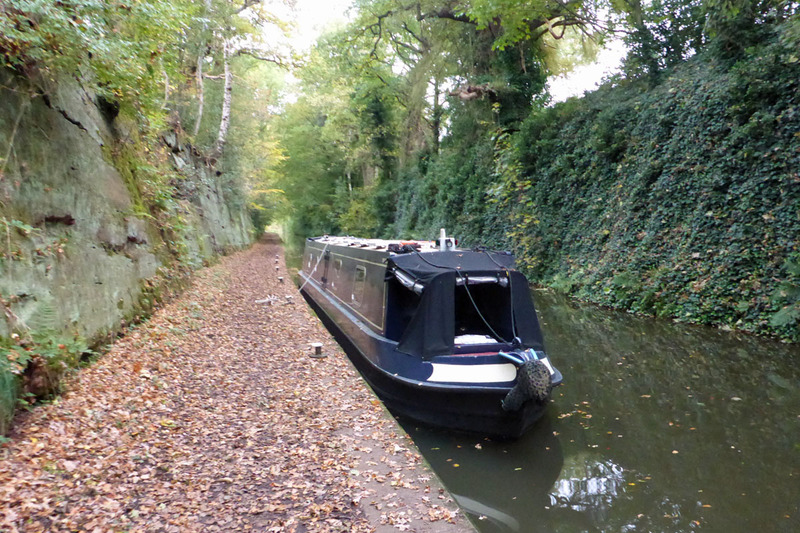 The scenery opens out a bit again, once you get towards the top lock. Once we got to the top lock of course that was when things got hectic. A chap going ahead to prepare his own locks from the first of the two boats nipping at my heels just caught me up in time to close the top gate for me. A 72′ job was preparing to use the winding hole (combined lock landing/service-area/winding hole…) and two boats were approaching from the canal above the locks. The two approaching, rather sensibly, stopped early to watch, and as the first of the two chase boats came through the top lock after me I switched places with the winding boat (in a two-part manoeuvre, since they filled the winding hole to capacity). Both chase boats wanted the services, as did one of the approaching boats (once they’d avoided the departing 72′ boat). The people from the house nearby came out to watch. I have walked ahead to scope out some of the next leg, the narrows section for one. They’re a bit… Deliverance. I don’t know what the English equivalent of “banjo music” is, possibly “descant recorder music”, but whatever it is, if I hear it anywhere I’ll hear it there. The cut there has that “abandoned, because we couldn’t persuade the workers to work there no matter what we offered in pay” feel to them. Remind me to take a fish-slice with me, just in case I have to defend myself from some chaps composed entirely of recessive genes and single-figure IQs. Mostly it all seems so enticing until I think of the fitness you much need and I get the point you make about wanting to do things your way in your own time. I imagine waking up to some of those beautiful scenes, or watching the sunsets and I think it would be worthwhile. Moving on from a particularly wonderful mooring must be difficult though? I do worry about you when the weather gets tough – stay safe intrepid wanderer! Sometimes – oftentimes – it is pleasant to just stop in one mooring and watch the world go by. Then again, if grotty neighbours move in nearby it is fantastic to be able to untie the ropes and cruise on! My goodness. It was a bit of a traffic jam there. I hope the one lane part is devoid all semblance of marine vehicle. Autumn has most definitely arrived here, the trees are throwing leaves away like confetti. Sounds like you’ve walked the entire length of the canal in short, sharp jerks, i’m fascinated by those weird paddles, don’t think I’ve ever seen or heard of them. Loving the reports of your travels. The paddles are an amazing piece of kit, and they take a lot of abuse (some folk don’t wind them gently down after use but just let them drop…). Some of them are in fantastic condition and are easy to wind up and down, others require a lot of muscle-power. ps I despair, this merrymumbles id just won’t leave me alone, even though I have deleted it.